YNS Challenge #38~Make it Sparkle! Hello! It's time for a new Your Next Stamp Chalellenge, and this time the super talented, Wendy, has challenged us to Make it Sparkle! We all love a little bit of bling, right?! 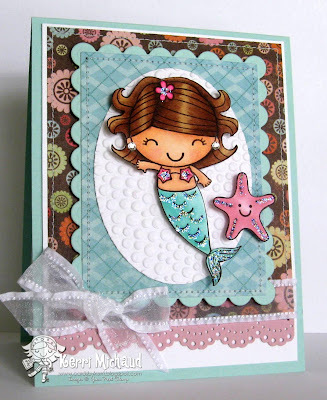 For my card I used this super adorable mermaid and starfish from the Happy Days Mermaid Set. I added lots of Stardust Stickles and also gave her some rhinestone earrings. I used dp from My Mind's Eye Fine & Dandy Tickled Pink along with some of my favorite Sheer Ruffle Edge White Ribbon by May Arts from the Really Reasonable Ribbon Store. Thank you so much for stopping by today, and I hope you have a wonderful Wednesday! Cute... She is darling, awesome coloring Kerri. WOOOWEEE Kerri you did a FABULOUS job on this sparkle challenge, love these papers and design sooo much fun and sooo beautiful!!! You rock gf!!! HUGS! Absolutely adorable Kerri!! Love all the textures and punches and of course your coloring! Absolutely darling Kerri!! I just love your coloring and the sparkle!! Stunning card and design!! Oh wow girly, this is just fabulous. The coloring on this is fantastic, especially her hair. Awesome as always. Hugs Diana ! What sweetness! All those layers look so good - especially all the brown! This is just so darling! Kerri this is adorable I think the mermaids will always be my favorites! So sparkling cute! Your coloring is fabulous, Kerri! Now I am in love with her!! Everything you did is just perfect for her! Darling! Loving all that sparkle too!